I got my own copy of this earlier this month – very excited! From her new home in Central Australia, on the eve of 2008, postcard author Beth Sometimes embarked on a daring challenge: to write a postcard to somebody, everybody, anybody and anything every day for the next year. Collected in this compendium are postcards to friends, exes, people she’d met in passing, strangers, rivers, mountains and just about anything she wanted to reach out and touch. A combination of handmade and shop-bought and weird and wacky, each contains a piece of writing of some significance; moments in time and personal reflections that create their own poetic narrative. 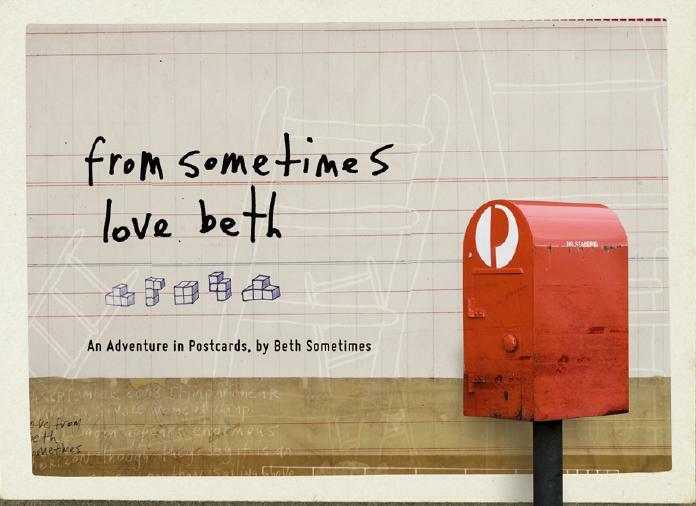 From Sometimes Love Beth weaves a world of rectangular emotions and cardboarderly camaraderie, where giant ideas roam miniature communiqués and the personal becomes public – just like on a postcard itself.